At RunnnersConnect, coaching isn’t a hobby for us; coaching you isn’t a side gig. Coaching is our passion and our commitment to you. Whether you want to hit a marathon best at 2:40 or 4:20, whether your 5k PR is 17:00 or 32:00, the key to improvement is in the training and the ability to stay consistent. We believe that if we create a meticulously researched training schedule that is customized to your exact fitness level, and then provide you with a team of experienced coaches to answer your questions and support your training, you can accomplish anything you set your mind to. We follow this up by connecting you to a supportive community of fellow runners to inspire and motivate your running. 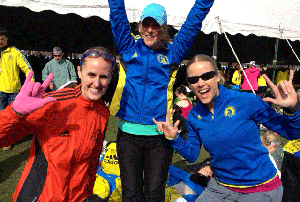 More importantly, we’re supportive of all runners no matter your speed, goals, size, age or experience level. Running is one of the only sports where it’s all about pushing yourself, not competing or comparing yourself to others. RunnersConnect was founded in 2011 by Jeff Gaudette. 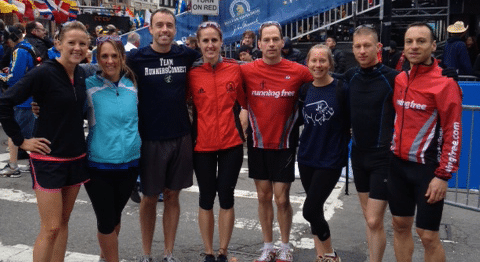 After years of coaching individual runners online, Jeff realized there was an important piece missing to his athlete’s training – team support. It’s easy to brush off coaching advice or believe that a coach can’t relate to your specific workout. But, when you have a team of fellow runners pushing the same limits, doing similiar workouts, and all striving towards the same goal it all starts to connect. When you have a bad workout, there’s nothing more comforting then a teammate reliving how they struggled with the same workout and then went on to run a new PR. As you get nervous before a big race, a coach can teach you all the mental tricks, but having a support team in place to commiserate with is priceless. Plus, sometimes you don’t even know what questions to ask. Having a team of fellow runners asking questions and learning helps you discover parts of running you never even fathomed. And that’s why Jeff founded RunnersConnect; To provide that layer of support, motivation and answers that didn’t exist in online coaching. Our team is now over 600 members strong and we’ve helped 867 runners in the last 2 years record new personal bests from 5k to the marathon. We have also grown to 7 coaches, a team doctor, nutritionist, writers and an awesome development team. We hope you’ll join us as you strive to be the best runner you can be. Whether it be signing up for our awesome emails (we publish 2-3 articles per week), subscribing to our podcast, or officially joining the RunnersConnect team, we’d love to help you. Our mission is to revolutionize how runners of all ability levels train and prepare for races. We know you're curious, so go ahead and see what we're all about. Your expert team of coaches have years of experience and have competed at some of the highest levels of our sport. Now they're here to help you achieve your goals. Don't be shy, check us out. Still have questions, or just want to speak to someone before signing up? No problem, contact us anytime.